Confession: I have read this book numerous times since discovering it as a teenager. I was (and still am) a horror addict and back in the day when there were only half a dozen tv channels, I was enthralled by the movie “Dark Secret of Harvest Home.” Bette Davis played the main character and I still read the dialogue of Widow Fortune in her memorable voice. As I impatiently awaited the arrival of new books by new authors to review, I decided to revisit this favorite. I’m so glad I did. It was written in the 1970s and set in that same time period. A time we would now look back on as innocent in comparison to our current tumultuous world. Main characters, Ned & Beth Constantine, decide to abandon city life and move to the very insular, agricultural town of Cornwall Coombe. Likely in Connecticut, but Tryon really doesn’t connect the Coombe to any particular state, just near the big city of New York. It’s a world inhabited by people who live off the land. They follow old world traditions and are not interested in the ways outside their hamlet. Education is limited and they seem content with that. Tryon writes a novel which unfolds slowly. Much of the book concentrates on daily life, personal relationships and the role of nature as integral to living. As I said before, I have read this book often in the last 40 (yikes) years, BUT, this was the first time I’ve read it since moving to my own, real life Cornwall Coombe. I grew up on the Jersey shore, and lived 20 years right outside DC. This spring I relocated to a very small town in West Virginia. There are only 650 residents in a town of almost 1200 acres. We are spread out. A trip to grab milk takes me 25 minutes each way. When I first moved here I was alone and it was 7 days before I saw a car on my road. At night, it is pitch black and the few restaurants close up early. Re-reading Harvest Home with my new understanding of small town living made the book feel completely different to me. Now I understand the perspective of 1970s farm life and how a community helps each other and relationships form quickly. Seeing Ned and Beth accepted into the fold and appreciate country life took on a new meaning for me. I am now living this. Hopefully, I won’t also one day understand the dark mystery which exists in the Coombe. 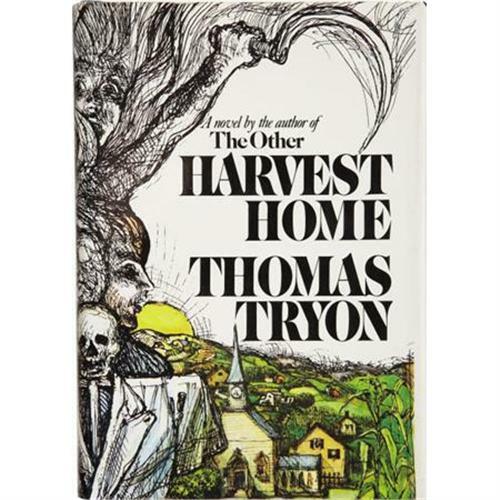 Tryon makes us fall in love with the simplicity of life and nature, and then he fills us with fear and dread. The book is 43 years old and a new reader might find it old-fashioned and dated, but to me that is one of its greatest charms. There are no young, hot vampires. Children aren’t killing one another in state sanctioned gangs. There isn’t a group of superheroes to save the day. This is a good old-fashioned story with substantial character development and a steadily increasing pace. Perfect for a cold October night when the leaves are swirling outside your bedroom window. Since I discovered this book after watching the movie, here’s a delightful little trip down memory lane for me. Ah, an oldie from my childhood. I love to be scared. I grew up in the 70’s when horror movies became popular. The Exorcist, The Omen, Halloween, The Legacy to name a few. Friday nights for me meant sleepovers with my best girlfriend Donna watching many Vincent Price movies on Creature Double Feature. Monday through Friday I also was tuned in to the “ABC 4:30 Movie” as I peeled potatoes for dinner. I can vividly recall our little 9″ black and white TV in the kitchen and how these movies made dinner prep easier. “The Dark Secret of Harvest Home” starring Bette Davis was one of my favorites. Finding a copy of the book on which that movie was based took me back to the 13 year old girl whose life was a lot less complicated and movies were a time to step into other worlds. Harvest Home is about a family who escape big city life and move to Cornwall Coombe, a remote hamlet where sheep graze the village green, community works to help one another, and life seems simple. Ahh, not so. After living here for a brief while, main character Ned Constantine discovers there are secrets lurking in this idyllic corn paradise. Tryon does an excellent job of painting word pictures to transport the reader to a place anyone would choose to move to – at least until they figure out what is really going on in the village. I loved the book, and if you like a good, old fashioned scary tale, I suggest you pick up Harvest Home to enjoy on a dark night. For those of you from the New York/New Jersey area in the 70s, I found a clip on youtube which will take you back in time. Enjoy!